On Wednesday 19th March LEYMN (London Early Years Music Network) held their fourth annual seminar, Born to Sing and Dance: The Importance of Music and Movement in the Early Years at Morley College. It was a jam-packed day of talks, demonstrations and panel discussions attended by over sixty members of LEYMN, early years specialists and music practitioners from across London and the South East. Professor Colwyn Trevarthan, Emeritus Professor of Child Psychology and Psychobiology in the University of Edinburgh, opened the day with a fascinating keynote speech introducing us to the very early stages of communication between small babies and their parents, and encouraging us to think about how understanding such forms of protoconversation, sounds and movements are imperative in our work in music and movement. The following presentation from performer Guy Dartnell gave us a clear insight into the (inflatable!) world and work of Oogly Boogly – an interactive event for babies and their grown-ups, where the babies interact with the performers, and an unpredictable but playful free-flow of conversational body language begins. Linda Bance presented the first practical session of the day, sparking a lively dance session to some wonderful examples of some recorded music she uses specifically for music and movement-making activities with younger children. You can see in the photos how much fun our delegates had with Linda! 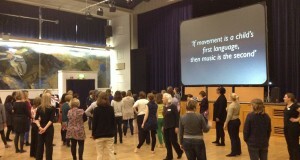 After lunch Margareta Burrell brought us all back to life with an ideas-packed practical on how songs and music can motivate children to explore music through movement and vice versa, encouraging the basic and essential elements of the child’s movement development. The performance (with gusto!) of Row Row Row Your Boat from over sixty delegates was certainly a highlight of the day! Calm was restored with a presentation from Ben Sandbrook about a parent-facing campaign around music, arts and creativity that has been worked up by the Early Years Strategic Roundtable. A passionate and constructive panel discussion with Jane Parker, Alison Blunt and Michelle Barrett provided a thought-provoking end to a day full of excitement and creativity, and a surprise last-minute announcement that we secured our funding for next year ensured that everyone left on a high! Keep your eyes peeled on the LEYMN newsletter and Facebook page for upcoming events and opportunities.